Scientists have discovered two huge new holes in the ground on the Yamal Peninsula in northern Siberia, adding to those identified last summer, RIA Novy Region has reported. Moreover, a grouping of dozens of smaller holes, known to scientists as funnels, has sprung up around one of the earlier discovered craters. Including those discovered in summer 2014, a total of four huge craters have now been found on the Yamal Peninsula. Environmentalists fear that more funnels may occur near populated areas, which could lead to disasters on a local scale. The new craters are located approximately 10 kilometers (6.2 miles) from Bovanenkovskoye, one of the largest gas condensate fields on the planet. 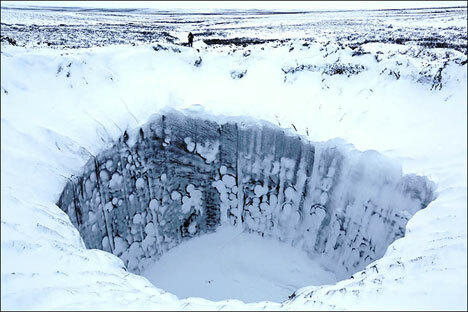 According to scientists, the formation of the holes is due to emissions of gas trapped under pressure in the upper layers of permafrost. The gas escaped after microcracks appeared in the thick ice because of warming in the polar latitudes. "I am sure that there are more craters on [the] Yamal [Peninsula], we just need to search for them... I suppose there could be 20 to 30 craters more," Prof. Vasily Bogoyavlensky, a corresponding member of the Russian Academy of Sciences and deputy director of the Moscow-based Oil and Gas Research Institute, told The Siberian Times. Bogoyavlensky has called for urgent investigation of the new phenomenon amid safety fears. "It is important not to scare people, but to understand that it is a very serious problem and we must research this."